Z: Tell me more about the "very beginning". From "who" came the idea of creating Ryzom? How dit it start, originally? An anecdote? DCC: It started when I was a webmaster at Gaumont (the movie society). Olivier had come a few times to the studio near République. Olivier was an entrepreneur who was unable to stand still and I was also very willing to create something substantial. He and I have always enjoyed paper roleplay and very soon we had explored the idea and the need to make a MMORPG. Olivier was very business oriented, but he also had quite a lot of relationships on the developers and engineers side and in finance. On my side, I already knew quite a number of good artists for the graphics, sound and animation especially. I was working at this time in the old studios of Luc Besson and I had lots of big names around me! We had created more than 250 websites for Disney, Ghibli and Sony. Z: And this idea of a totally vegetable world? Where did it come from? DCC: Vegetable world… First there’s a big influence from Ghibli: Miyazaki, Nausicaa, Mononoke... But not only them. Also we wanted to have choices among the possible universes so we contacted role play creators, who proposed several things to us amongst which was a vegetable world. We started on this idea and then cooperated to transform it and arrive to the excessiveness that we know. Especially regarding the pre-production drawings! I was Nevrax co-founder. Nevrax that was first called Izanagi; and in prod(uction), I’ve been the creative director in charge of the writing, the graphics and the sound. So I was in charge of deciding what entered the game or not. Z: From what I’ve read, I’ve seen you as the spark that launched all of this, and the fire that has fed it for a long time, aren’t you? DCC: Indeed, I’ve been the one who has led and set the vision, but it was a very collaborative work. Everyone played their part in it and not just put in their two cents. However, I was the only one who knew everything. Not because it was forbidden to others, but because everyone was very busy with what they had to do and the whole had been in a state of permanent evolution for a long time. So I was often led to keep the ones and the others informed about what was changing and might affect them. Z: What would you change / do otherwise? DCC: Oh my, huge topic! It would take us two days! The start, the pre-production. It should have lasted a lot longer and with a lot fewer people. But because we were in a hurry, very excited, and very inexperienced, we rushed to the 2D drawings without enough exploration of our ideas or preparation of the ground. None of us had ever done this kind of game. Next I think we should have released a smaller game sooner, but working very well. Keep it in alpha for a good time to fiddlewith it in detail, and then release a beta a bit bigger and come out with a well broken in production capacity. Z: Er this hasn’t changed that much… the pipeline is still giving us cold sweat! On the other hand, the particles system is still rocking, a must! DCC: Indeed particles were great. The level design tools weren’t simple either! However, there weren’t hu ndreds of us as there were at Blizzard. The interface took a long time to set up also. There are lots of things that I would do differently. Yet, with time, only good memories remain, memories that arise mostly from the team of that time. One thing that I wouldn’t change! Z: Do you know where the names Georges (the editor) and Sabrina (for the balancing points of the Sbricks) come from? Oh yes, I’ve got technical questionsin my bag! DCC: Georges and Sabrina were christened by the teams who created them. We were fed up with the technical names for the tools. The idea had been floated to give them people names. Maybe starting from an acronym, then someone might have said Georges and another one answered Sabrina. Why couldn’t tools and technology be female after all? Z: I’ve also seen that Stallman was a member of the "strategy group" (source: [color=#ffcc00][i]http://www.journaldunet.com/0111/011127nervax.s html[/i][/color] )? He had a real role in Nevrax? DCC: Ah, Richard... The man with the flute. Olivier and others on the team were fans of Free Software. And Olivier brought Stallman to evangelize a bit at Nevrax. Stallman ended up on the Board of the company as an advisor. He came, made some speeches for one day. I played Diggeriddo with him. He said we had to start to rewrite Photoshop and 3DS Max before we could make our game, which of course had to be done on Unix, then he left and we never saw him again. So no, no strategic role. He didn’t even speak about us outside and has never given any advice. Which doesn’t remove a thing from his vain wishes. I’m ultra-glad to have risen to the challenge of OpenSource, but it hasn’t helped us so much to develop the game. No one has ever raced to code with us, find and fix bugs. Vianney may contradict me, he knows all this better than me who doesn’t understand a thing in code. Z: A mitigated track record… but Free is a complex mechanism. DCC: Very complex. I’m delighted to have done this choice, but it was the origin of lots of frustrations also. Z: A very important question! If I’m to forget it, I’ll be frowned upon. "Have you kept some documentation somewhere?" DCC: I wasn’t allowed to when I left. Of course I’ve got some documents, but nothing that you don’t already have. 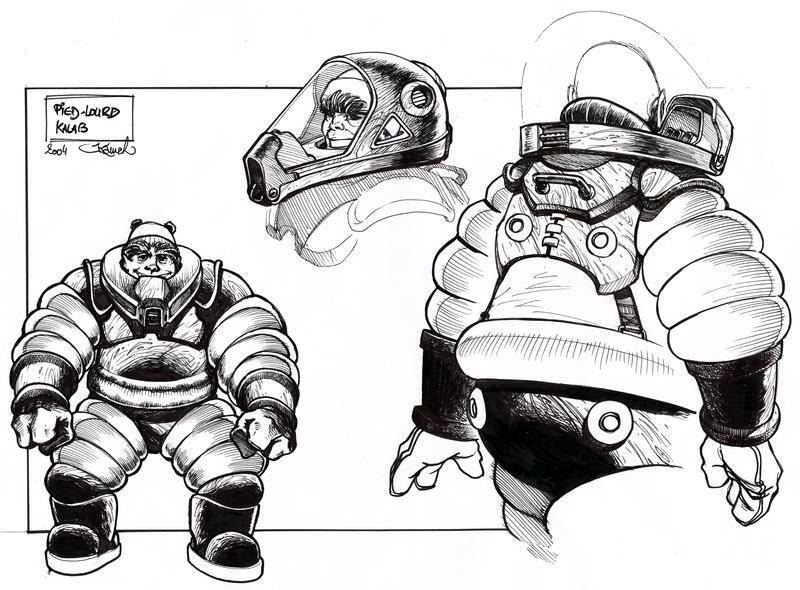 Z: In the concept art we find the "Kalab" people. What happened to them and why aren’t they implemented in game? DCC: It was impossible to do it at that time: exoskeletons, cities hung in the air, the builds of the character which didn’t match with the other peoples… And we had to chose four peoples, period. There was not enough time to create all of them. Well, not enough time… Let’s say not enough money, rather. Z: There are pretty images left as a result. Was there something planned for the players to go back to the Old Lands one day? Would they have been able to find some Momos back there (the primitive race exterminated by the Matis)? Some players have also asked me “Why the Momos have been exterminated?” and I was wondering if maybe it wasn’t just “because” (those are nasty Matis!!!). DCC: Lots of projects, but not enough time to realize all of them, nor even sometime to write them. That’s why some things are mentioned today in the book that I’m writing, because I knew where I wanted to lead all this. But I had no time to write it down on nice production documents. It probably contributed to my desire to write today. Not nasty Matis, but frightened Matis. Z: Another expert question : Is it true that Ma-Duk wasn’t part of the original notion of Ryzom ? Or was it there from the start and just revealed late? DCC: Ma-Duk has first been a production concept, not in-game. To hold a world, you need a mythology of its creation, true or not. You need one that is, especially in Fantasy, visible in its effects, in this case the Kamis. Where are they from? What are they for? Are they related to something bigger? All these questions have to be addressed in the game evolution, with great revelations on top. Nothing has ever been written in the game or in production on this topic. It doesn’t mean that the box is empty, not as far as I’m concerned at least. Ma-Duk arrived a bit later in the game indeed, but not because the backstory wasn’t one of the priorities, far from it. It was introduced in some texts to enliven the universe’s background, to give more identity basis and actually to place an intrigue that leads back to the origin, but not only, since Ma-Duk was supposed to appear in the game. From origin it became source. Permanent source. A bit like Jena on Karavan side. Both entities were supposed, one day, to reappear with others. Z: Others? Such as Elias or others also? DCC: Yes, him also. The backstory talked about them. A common history, leading to Atys as it is at the game time, with new unexpected developments over time, on a longtime scale. They are real people, with a legendary past and so a bit altered, but real ones anyway in Atys history and with intrigues still running that the players were supposed to discover the ins and outs of within the game evolution. Of course it hasn’t been possible and I understood it quite soon when we started the third production year. We were under a deadline, me as the first of all, and so I left my notes out to concentrate on the survival of thesociety and the project release. Ma-Duk, Jena and Elias have hence never walked in game, in the texts. What is true on the other hand, is that none of them was in the bibles from the prod and pre-prod. Jena is on the game’s cover because she was supposed to appear later. I wanted a backstory that was not only wallpaper. I wanted for the important characters of the past to resurface in the present of the game with consequences. Z: And that means… we’re still waiting for Jena! DCC: Well yeah. So am I! Jena, Elias, Ma-Duk..
Z: What have you done since the last time you’ve been seen officially on Ryzom? Since the end of Nevrax? DCC: In ten years, quite a lot of things. Two children first and a nice wedding! I’ve also traveled, for example I’ve crossed China over three months, from Mongolia to Hong Kong. I’ve also done some consulting for an online game, of the same kind as Anno Online. I also had something of a big timeout. Nevrax wasn't exactly a walk in the park, Ryzom wasn't either, and I took some time recovering from lots of things. I sat down and thought about what I wanted to do: video games, online or not, are very constraining and not only because of the technology, or the size of the teams and the investments.It’s very specific as a work and creation environment. I’ve been offered jobs, very nice jobs, but the huge investments in play mean that these are systematically organizations where the internal politics dimension is heavy. So I decided to go towards writing. I’ve also done a lot of it, and for Ryzom it was tons, but in the form of production documents intended for the teams only. So it was more some encyclopedia, with a very factual, objective and high-level point of view. Nothing to do with the story of a few heros, their introspections, etc. So I followed 2 courses.One in the CEEA in Paris writing TV series, and the other one with a US script doctor based in L.A.
Z: So you’ve fond your way to writing scenarios for TV and movies? DCC: It was great, I sold 2 concepts for TV series to French productions, but nothing happened with them. That world is ultra-closed from inside, same as a submarine, and the status of the author stays very far in the background of the project, if ever it is done. I turned then to writing books and, there, I’ve really enjoyed it. So I started a series (I need room, I’m finding stand-alones too short). did the book and I put it aside to restart some training work, because I saw a lot of things to correct. That was a year ago. We’ve just finished book 1, currently being checked by pros for the corrections. Translation into English is already in progress. It’s called Anthalys and I’m in the middle of my work on book 2, I’ve got to complete it by April 2016. Z: I’m looking forward to reading this! DCC: Anthalys should indeed appeal a lot to Ryzomians. I’m looking forward releasing it, but you’ll have to wait, because I first have to finish the 2nd before releasing the 1st. That being said, there will probably be some exclusiveness for Ryzom players. Z: Can you reveal a bit more on the theme of Anthalys? Or is it better to wait for the official release? The first book has 70 000 words, with illustrations. The second book should be twice that big and will be released both in the US and in France, first as e-book and then as paper book, except in France, where I still don’t know. Z: It will please Ryzom’s fan to learn all this. You’ve followed what happened to the game after you left? DCC: Yes, but from far off. I wasn’t in the game, but I’ve followed. There has been lots of tumult and I’m all the more appreciative of the efforts done by the ones who’ve maintained it on line and have made it evolve to still be there today. There is something special, very special, about this game -- and on both sides. Dev side and players side. Z: Yes, it’s an epic battle… and isn’t finished yet! Some players have asked me things related to the new material. For example, the arrival of the marauder faction and what is related to it has jostled the players quite a lot, both the ones who loved it and the ones who haven’t liked… What do you think of this faction,its integration and its interpretation? DCC: When I was in the project, meaning ten years ago, the marauders were intended to be separatists gathering all races, a bit like the pirates — the true ones — from the time of the monarchies. Nationless but also founders of the democracy, of the vote to chose their leaders and of the “everyone gets its share of the treasure”. Intended to be played one day, but it never managed to happen in production, far from it. A living world, and not a series of repetitive missions, but in production there were big problems to set up the client & server technologies to allow this kind of thing. And I’m not mentioning the tools for production, level design, etc. At some point, we had to have less big eyes and lots of things went down the drain. As a result, it’s quite difficult for me to know what the marauders have become now. Z: In what had to go down the drain, there are things that you regretted afterwards? DCC: Yes. Everything, and it’s really not the fault of the team. This kind of game requires tens of millions for investments and at that time the technology was really totally new. We created everything ourselves from scratch. It was already huge to release the game, but also very frustrating. Z: Yes, and even today there are things in this game… It’s still at the cutting edge. The creatures groups AI continues to be sublime. You know, I’ve been disappointed, playing more recent MMOs, not to find anything as good of thatkind of thing? Z: On the creative side, you have fun with Ryzom, even if… yeah, if we had more money, we’d appoint devs to update some tools! It’s already amazing that this project could be founded. DCC: The big investments don’t like to go out on a limb with creativity and originality. Things like the Oculus may change things. Anyway, I’d like a lot to restart Ryzom from scratch to make a real immersive world in VirtualReality. J'ai eu l'occasion de discuter avec lui il y a quelques années, c'est un gars sympa et intéressant. Je suis curieux de lire son bouquin! Super de lire ça ! Et du coup, à tous nos détracteurs, ce grand homme confirme au passage que l'idée de rendre les maraudeurs jouables n'est pas sorti du chapeau. I read this whole interview. I too see that Marauders was an idea from the beginning. Not just an idea that is recently introduced. Yeah! C'était top de faire cet interview avec Zatalyz, et merci à Tamarea également. Ryzom reste à jamais une expérience et un attachement très particulier pour moi et pour beaucoup de devs, voir tous. Cela nous fait un immense plaisir de voir Ryzom toujours en ligne, côté joueurs et côté équipe - souvent les deux. Aux vues de ce qui se fait - ou ne se fait pas - ailleurs, je reste extrêmement fier de ce que nous avons réalisé avec Ryzom, et ce malgré les imperfections, les manques et donc les frustrations. L'ambition d'un monde vivant demeure, d'abord grâce à vous, et je crois que c'est vers cela que le futur des univers en ligne devrait se tourner, plutôt que rester là, les bras ballants, empêtré dans une vision statique de "parcs d'attractions" en ligne qu'on nous sert à tous les coins de rue. Bon nombre de devs se laisseraient sans doute tenter en tout cas. De mon côté l'écriture avance, mais j'attends d'avoir terminé le livre 2 pour sortir le 1. Pour ceux que cela intéresse, les membres de la communauté Ryzom (joueurs & devs) auront droit à une version gratuite (au choix Français ou Anglais). Il ne s'agit évidemment pas de Ryzom, mais c'est cuisiné dans les mêmes chaudrons :) Je ferai signe à ‎Tamarea le moment venu, d'ici là je vous souhaite à tous de très bons moments sur Atys! i look forward to reading the books. (english) thank you David for all the time and effort. it's truely a great joy to have the chance to peek into the mind of the man with the plan. Il a dit "destinés à être joués un jour". Il n'a pas dit "destinés à être implantés à l'arrache une première fois sur une couche gameplay qui ne s'y prête pas et une deuxième fois à l'arrache également mais avec un début de couche gameplay s'y prêtant un peu plus et riche en problèmes divers et variés, le tout sans community manager pour un peu fédérer/canaliser le mélange détonnant de joueurs s'étant greffé sur cette couche gameplay – et bien entendu sans avoir fixé la lore concernant les Maraudeurs et sans avoir de vision quant à ce qu'il faut en faire". Sinon merci pour l'itw, très curieux de lire Anthalys. Sinon c'est exactement mon avis concernant les mmo actuels. Et sinon merci pour l'ecorce ! Dans ce cas là, concrètement, autant ne rien implanter du tout. Ce n'est pas comme si Ryzom avait les moyens de "bien" faire les choses, aussi bien en raison du manque de ressource que du manque de salariés (ceci n'est pas une critique vis à vis du staff, un grand respect au travail des bénévoles). Je ne pense pas qu'en implémentant la faction aujourd'hui, cela se passerait beaucoup mieux. Dans 10 ans, peut-être. En tout cas, j'attends toujours avec impatience l'arrivée de la faction Ranger. Mais c'est peut-être une mauvaise idée, après tout ! J'ai fait partie du bateau Nevrax pendant près de 3 ans, en tant que testeur / QA / community manager, et ç'a été une aventure très enrichissante. Mon principal regret concernant Ryzom, c'est / c'était le chara-design ; les visages, en fait. J'aimais beaucoup les différentes races et leur background culturel qui influençait tout, depuis l'architecture jusqu'aux vêtements et tatouages... Mais les visages, vraiment, y'avait un truc qui ne passait pas trop (désolé ^^). Ceci mis à part, c'était vraiment une belle réussite de lore et de technologie, avec un thème ORIGINAL et de vraies ambitions !